What is the story about. Ra Eun-Ho dreams of becoming a popular webcomic author in the future. To make it happen, she has to get to her dream university. The boy, she has a crush on, is also studying there, so she is doubly motivated. Unfortunately, with her low grades, she has almost no chance. 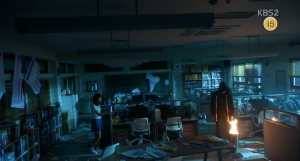 The situation is getting worse due to the unexpected appearance of the mysterious X, which destroys school order and brings chaos to students’ lives. All the blame for his actions falls on Ra Eun-Ho, who can be expelled from school, which means the end of dreams of college. The poor girl has nothing left but to catch X herself and clear herself of the charges. 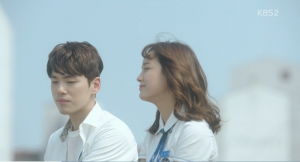 “School 2017” is another drama from the popular school series. I have to admit that I didn’t watch any of the previous ones, so I didn’t know what to expect. From the first episode drama interested me with the plot and amazing chemistry between the main characters. Ra Eun-Ho is a student with a strong sense of justice. She openly disagrees with students’ discrimination at school. Armed with a charming smile and a brave soul, she puts an active resistance to injustice towards students, which some teachers do not even hide. Hyun Tae-Woon is another story. At first, he seems to be an arrogant son of a school director who doesn’t care about anything, especially what others think about him. However, thanks to close contacts with Ra Eun-Ho and unusual events in which they participate together, he becomes the perfect material for the boyfriend that every girl dreams about. He is supportive, devoted and charmingly jealous, without losing his self-confidence. 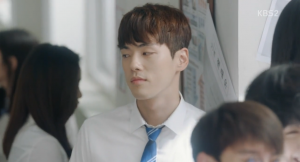 Kim Jung-Hyun is sensational in this role. I have the impression that his character stole the whole show. 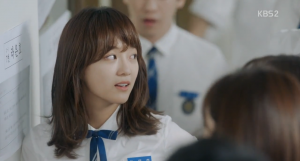 This series shows the school life of an average Korean student, which is not easy. Continuous rivalry, pressure to go to university, endless tests and lack of any free time. The ranking list affects how students are treated. Nobody cares about those with the worst grades. Ra Eun-Ho, Hyun Tae-Woon and Song Dae-Hwi deal with stress and frustration in different ways. Each of them has a different situation at home and a different position in the school, but they also have dreams that they try to fulfill despite the omnipresent adversities. Ra Eun-Ho’s determination can be envied. Even Hyun Tae-Woon is impressed. The big advantage of the drama is that it doesn’t drag on the secrets and misunderstandings between the characters. Everything is explained very quickly thanks to the fact that the characters in most cases do not hide their feelings and are simply honest with each other (well, maybe, except for the boys, their problem is something more complicated). 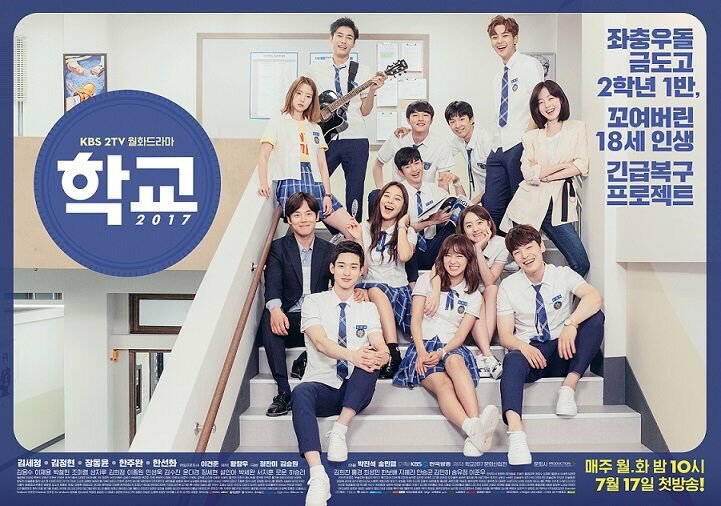 Drama “School 2017” has permanently entered my list of favorite dramas. I remember that waiting for the next episodes was a real torture. I recommend to anyone who likes a light romantic comedy with school problems in the background. 1.Amazing chemistry between a pair of main characters. 4. Thanks to this drama I got to know Glen Check music.